In their second-quarter letters to investors, multiple hedge fund managers have focused on the many contradictions existing in the market right now. Basically, the markets aren’t doing what they should be doing right now based on macro factors, and many hedge funds have been paying the price. In fact, most of 2018 has been a year of idiosyncrasies and contradictions thus far, and a new survey provides some interesting illustrations of these. For example, fund managers see the ongoing trade war as the greatest risk right now, but even though tech companies could be negatively impacted by it, they’re still buying up tech stocks like they’re going out of style. Bank of America Merrill Lynch strategists released their August Global Fund Manager Survey this week. 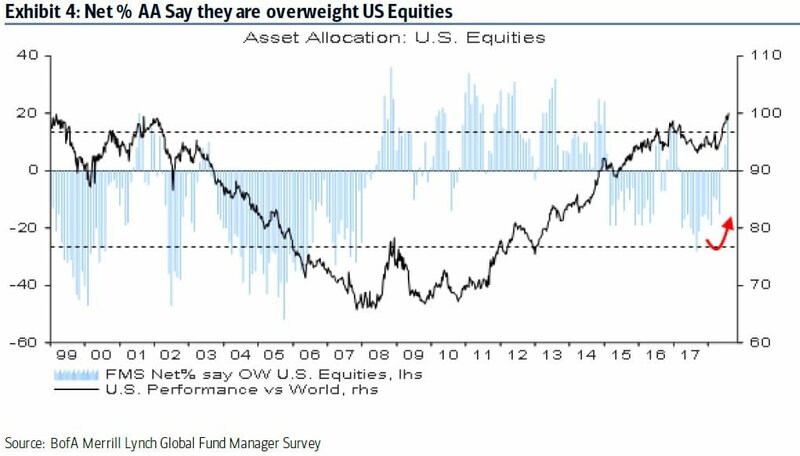 They found that fund managers now hold the largest overweight position in U.S. stocks in more than two years. Earnings estimates are a key driver of U.S. stocks right now, as the outlook is now at the highest level in 17 years. Tech remains the most popular sector despite the soaring valuations which many hedge fund managers have said are divorced from reality. 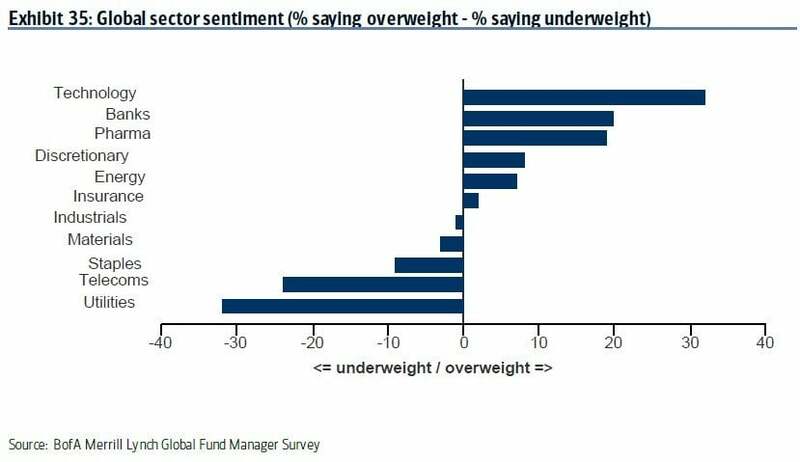 After tech, the next biggest overweight among fund managers is in healthcare. Essentially, value fund managers are now lying in wait for the U.S. stock market to get with the program and finally start reflecting some of the current macro factors in the way they usually do. 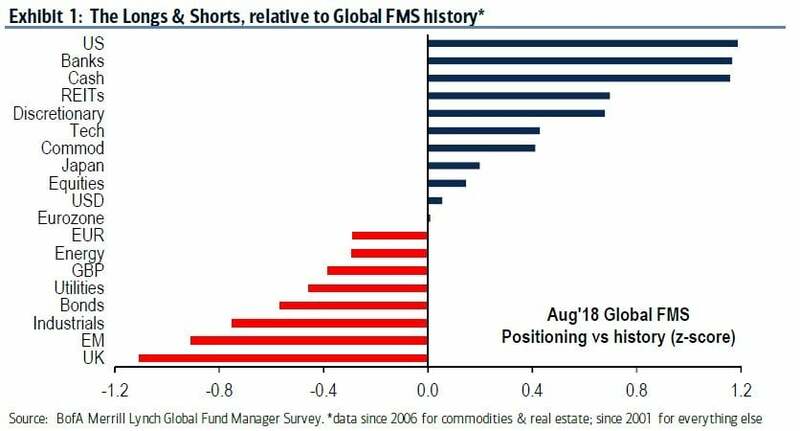 In addition to U.S. stocks, fund managers are long on cash, having increased their positioning from 4.7% last month to 5% in August. They’re also short emerging markets with small underweight positioning in EM stocks, industrials and materials. 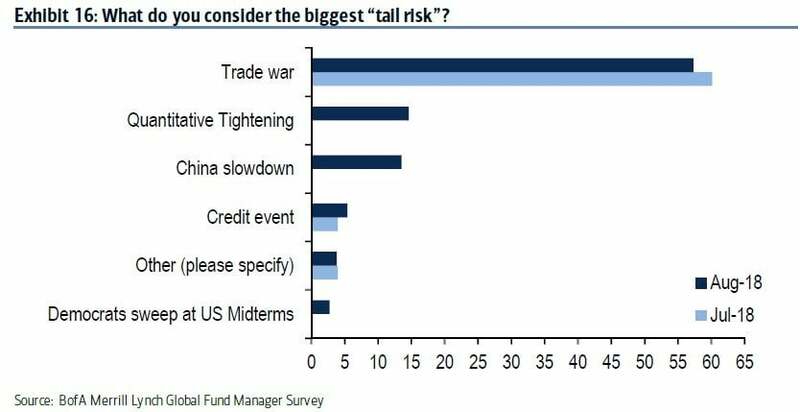 The firm also found that fund managers see the trade war as the “biggest tail risk,” although concerns about it have ticked down a bit from July. Still, the trade war worries are seen as much greater than any other major tail risk over the last few years. After the trade war, the next two biggest tail risks are seen as quantitative tightening and a slowdown in China. Tech remains the favorite of fund managers, followed by banks. As tech valuations continue to soar, it comes as little surprise that the most crowded trade is in the tech sector. According to the survey, fund managers widely see the long FAANG + BAT trade as the most crowded, and they have since February. In fact, this view has gotten more and more widespread over the last couple months. It’s no wonder some hedge fund managers are talking up the tech bubble while other market watchers repeatedly claim there is no tech bubble. The well-known FAANG + BAT acronym stands for Facebook, Apple, Amazon, Netflix, and Alphabet (GOOGL), plus Baidu, Alibaba, and Tencent. Even though tech remains strong now, we could finally see the end of tech’s popularity in the next month or so, based on the results from other surveys. For example, another BAML team found this month that active managers have begun moderating their tech positions, beginning the rotation out of tech and discretionary and into cyclicals. For now, the fact that fund managers are still loading up on tech stocks is particularly interesting in light of the sector’s soaring valuations and especially the trade war. Multiple analysts have been writing for months that tech majors such as Apple and Google won’t be severely impacted by the trade war, but it seems like only a matter of time before reality begins to sink in. Trump’s tariffs are heavily targeting goods from China, which include many consumer electronics devices. Almost all major supply chains for electronic devices are located in China and other parts of Asia, which means an increase in the bill of goods for devices. Networking equipment such as devices used by cloud companies and also modems and other wireless components for mobile devices are expected to be subject to tariffs by the end of the year. Mobile device chips will probably also be subject to higher tariffs. Even though tech behemoths like Apple, Microsoft and Google will be able to absorb higher component costs for a while, at some point, they will probably raise their prices. Either way, the trade war is likely to negatively impact profits in the tech sector, but based on the never-ending tech rally, you wouldn’t know it.